With its committed readership of 40,000 subscribers, Message is often “gifted” to friends and loved ones. It is given away during large commemorations such as the Inauguration of President Barack Obama and the celebration of the 50th Anniversary of the March on Washington. 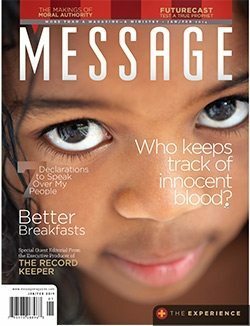 Now, Message reaches more readers than ever from its enhanced digital platforms–messagemagazine.com, and sharemessage.org. Loyal readers follow our Facebook page for daily devotionals and Bible readers participate in the first ever interactive Bible study “The Experience,” by posting their comments with the #messagemagazine. Because God has been forever faithful to us, and because His mercy endures forever, Message will forever share the word of God and the abundant life with spiritual seekers everywhere.